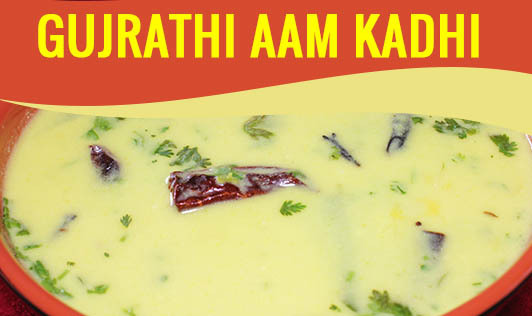 Gujrathi Aam Kadhi is a delicious yoghurt-base curry that is sweet, tangy, and spicy; all at the same time. Savor this delicious dish with parathas, rice, chapattis, or desi channa, this mango season. Red Chili (Dry)- 1 no. Green Chilies (Slit)- 2 no. Curry Leaves- 5 to 6 nos. • Mix all the ingredients along with 2 cups of water in a bowl until it is well combined. • Now bring the mixture to a boil, while stirring continuously. • Once the kadhi comes to a boil, turn the heat to low, and simmer for 10 minutes. • Heat ghee in a sauce pan, add mustard and cumin, and let them splutter. • Add cinnamon, dry chili, and curry leaves, and stir for a few seconds. • Pour the tadka over the simmering kadhi. • Turn off the gas and garnish it with chopped coriander. • Serve hot with rice, chapatti, or paratha.